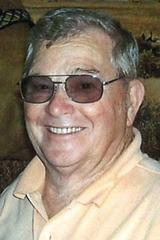 Jerry L. VonMoss, of Commerce, Okla., passed away on Wednesday, April 17, which was his 75th birthday, at his home in Commerce. He was born on Easter Sunday, April 17, 1938, in Picher. Jerry was married for almost 55 years to Colleen Newton VonMoss. His experiences were many and his life full and rich. Jerry worked at B.F. Goodrich for 20 years. He was well known for shoeing horses all over the area for 30 years as well as teaching the art of shoeing horses at NEO for 11 years along with teaching other equine care classes. With his wife Colleen, he founded and ran Unique Designs, a specialty imprinting business, for 10 years. For the last 29 years Jerry served as the Pastor of Southeast Baptist Church in Commerce. Jerry was a graduate of Commerce High School, class of 1956, and attended NEO. Jerry was a hard worker, a lover of life and his family, and a believer in Jesus. He was widely known and loved by many. He never met a stranger. Wherever he went he either found a friend or made a friend. He had an amazing talent for finding and meeting famous people. He made a friend of 1970's rock and roll singer Steve Miller without knowing who he was. He answered a ringing phone once, simply because he was the closest person to it and found himself talking first to Rosalyn, and then to her husband Jimmy Carter, who he promptly invited to come visit Southeast Baptist Church. During the invitation at a revival meeting, he captivated W. A. Criswell, the famous pastor of First Baptist Church Dallas, Texas who promptly stopped the service so Jerry could stand behind the pulpit of that venerable church and share a word with the congregation. As a horse shoer he was widely regarded as the best in the country and found himself shoeing Shetland ponies for kids, horses which won world championships in rodeo and cutting horse competitions, and for celebrities such as Wayne Newton, Roy Clark, George Strait, and cowboy actor Ben Johnson. He was pursued by Anheuser Busch to be the national ferrier in charge of shoeing the famous Clydesdale horses but refused due to the jobs travel demands and not wanting to be involved in the alcohol industry. As a pastor he spent his career in one church, taking on Southeast Baptist when it had ebbed to only eight people in attendance. In beginning his ministry he proclaimed the south would rise again and the church exploded in growth and life. In his ministry there Jerry would baptize over 1,100 people and Southeast Baptist was frequently recognized by the Oklahoma Baptist Convention as one of the top evangelistic churches in the state. Jerry was a proud father and grandfather, who saw his children and grandchildren as his life's greatest achievement. He was a loving husband to Colleen, leaning on her and depending on her greatly as a partner in all his ventures and accomplishments. He was preceded in death by his father, Edward VonMoss, his mother, Hazel Heatherly VonMoss; and his brother, Jack Edward VonMoss. He is survived by his wife, Colleen Newton VonMoss; and his children, Sandi Pannell and her husband, David, of Commerce, Mike and his wife, Barb, of Jesup, Ga., and Jason and his wife, Rene, of Olathe, Kan. He is also survived by his grandchildren, Joshua VonMoss and his wife, Lindsay, of Gainesville, Fla., Justin VonMoss and his wife, Leah, of Tallahassee, Fla., Shala Pannell and Jarrett Pannell, of Commerce, Alexis Piseno, Tatum VonMoss and Evan VonMoss, of Olathe Kan.
Funeral services will be Monday, April 22, at Southeast Baptist Church in Commerce. Rev. Gerald Dyer, Rev. Mike VonMoss and Steve Hunter will officiate. Interment will be in Glen Abbey Memorial Gardens in Miami, Okla. Pallbearers will be Larry Kelley, Bob Goodrich, Jim Mullin, Carl Berry, Jack Abernathy and Mark Long. Dr. Steve Grigsby and Deacons of Southeast Baptist Church will be honorary pallbearers. The family will receive friends Sunday evening from 6 to 8 p.m. at Southeast Baptist Church.